English Title: Class President is a Maid! Our heroine is AYUZAWA Misaki, an outwardly normal but actually very violent high school girl. She attends a school that up until this year had been an all-boys school but recently went co-ed. (what is UP with that? This is like the 3rd series I have read lately that takes place at a recently co-ed school. See also: Zero Count and Rockin Heaven). Misaki is president of the student council, and maintains strict order and demands compliance. She is not impressed with any of the guys at her school, and treats them all with contempt. Misaki doesn’t like guys because her father ran out on her family when she was little. She routinely abuses the guys around her, who all tremble at the sight of her. It will take a special guy to impress her. One day Takumi happens to find out Misaki’s dark secret- she works a part time job at a maid cafe! This totally goes against the hard-as-nails violent image she has at school. Ahhh… this makes for an interesting situation. Misaki is like a whirlwind of energy, leading the student council, and working at the cafe. Her attitude is very direct and rough. She is strong and smart, and can beat up the guys at school without difficulty. She mutters to herself a lot, and her language can be rather tough. But she has a soft side that Takumi eventually notices and that part of her catches his interest. 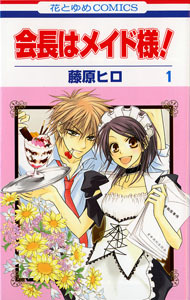 Takumi learns that Misaki works at the maid cafe to support her weak mother and younger sister. Of course he ends up visiting her at work a lot, much to her general dismay. Much of this series seems to be Takumi sort of going along for the ride as we follow Misaki’s various antics as she whips everyone into shape at school, and presides over various school events as the class president. Then there is the double life with her job at the cafe that she tries desperately to keep secret. Will Takumi reveal her job to the other guys at school (there is that threat hanging over her)? Can Misaki find another job before this happens? The maid story takes up 3/4 of this books, and will continnue for another volume at least. There is another touching litte romantic one-shot story at the end of this which is very nice, though somewhat sad. I really enjoyed the art style in this manga. The art is clean (non-scratchy) and detailed. Occasionally it gets a bit cluttered, but I still like it XD Misaki is very cute, and her maid uniform is reasonably original, as far as maid uniforms go. Takumi is a hottie. ^_^ I look forward to reading more of this!